The 15-month project had as its day to day mission the building of an inclusive coalition of support not only for those goals, but for the pursuit of those goals through supranational democracy—the active participation of citizens as citizens, in the international spaces where governments negotiate with each other. It was clear from many month of working with CCL volunteers around the world that we needed to create this new platform, to bring people together around a shared mission of active global citizenship. Many countries, if not most countries, will take their climate policy cues from the global process, so we needed to open that process up, and find a way to bring people’s voices into it. 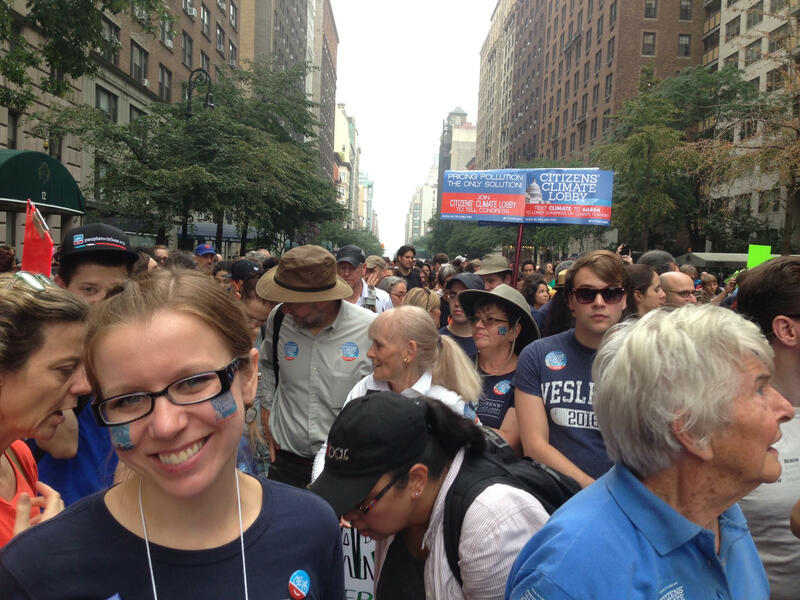 We carried the energy of the Sept. 21, 2014, People’s Climate March, into our Global Launch. Before the Sept. 23 launch event, at Impact Hub on Broadway, in New York City, we shared the Pathway to Paris Whitepaper, outlining Core Principles for efficient, effective, transparent and inclusive carbon pricing, with leading diplomats from the World Bank and other global institutions, in the General Assembly Hall, during the UN Secretary General’s Climate Summit. In October 2014, we asked the World Bank and IMF to commit to supporting both carbon pricing and expanded citizen engagement. The Managing Director of the IMF told us she would, and the President of the World Bank affirmed his commitment to both as well. Throughout the fall, we hosted a series of Global Online Policy Forum events, in preparation for bringing the views and concerns of citizens and stakeholders into the global negotiations. In December, we brought the Pathway to Paris project, the Core Principles on Carbon Pricing and a call for expanded citizen participation to the COP20 in Lima. During two weeks in Lima, the conversation about pricing carbon shifted from “It’s not on the agenda” to “There is no more affordable, more effective way to motivate all of the other solutions we want to deploy.” This was a lesson in coalition-building; an informal coalition of carbon pricing advocates came together, through dialogue, brainstormed together where there was common ground, and learned, without a brief or formal instruction, to share that core message. 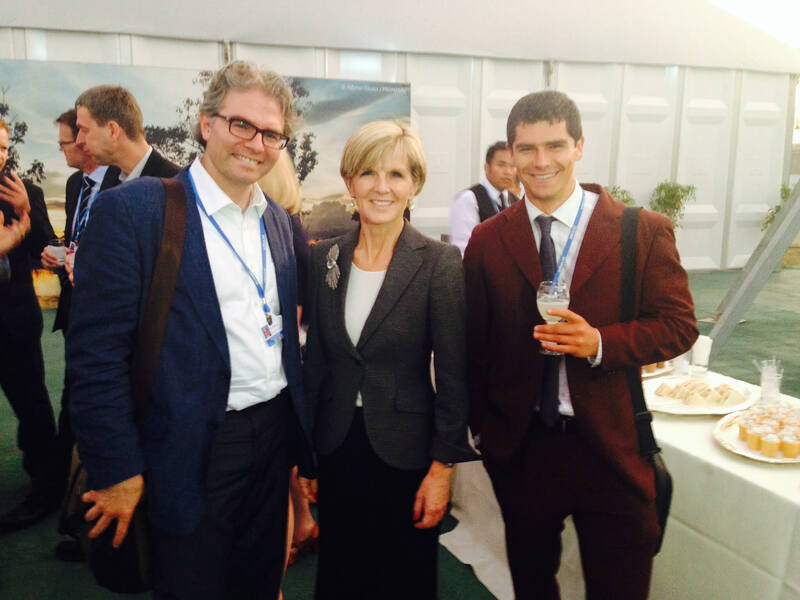 We met with fellow policy advocates, supporters of rival carbon pricing strategies, diplomats, UN staff, the Director of the International Energy Agency Maria van der Hoeven, and the Foreign Minister of Australia Julie Bishop. We established a standard whereby top government officials would meet with non-governmental representatives of their own constituents, so personal messages can move directly between citizens and their leaders. In January 2015, we supported the launch of Action2015, with the first in a year-long series of Working Sessions, where citizens, stakeholders, advocates and policy-makers, come together to share their values and their vision of the future, and then to work on policy advice, rooted in their affinities, to the global process. Through the hosting of working sessions in communities, at the National Council on Science and the Environment, at Villanova University, the World Bank, and elsewhere, we were able to develop a new strategy for public participation, through citizen-led policy-focused workstreams. In February, we attended the intersessional UNFCCC climate negotiations, at the 8th meeting of the 2nd session of the Ad-Hoc Working Group on the Durban Platform for Enhanced Action (ADP) in Geneva. We continued this work in Bonn, throughout the year, and began charting a strategy for adding language about universal principles for transparent, equitable, effective carbon pricing, into the negotiating text. In early April, our Carbon Pricing Workstream went live, and took up that work. The result has been the development of principles that outline universal principles for efficient, effective, socially equitable carbon pricing strategies, as well as a series of design elements that can assist policy-makers in achieving economy-wide incentives for change. This work is rooted in the Core Principles from our initial Pathway to Paris Whitepaper, which were derived from the structural logic of the Carbon Fee and Dividend proposal, and the findings of REMI’s analysis of how that plan would play out across the American economy. During the Spring of 2015, through the Pathway to Paris project, Citizens’ Climate Lobby became one of the founding Strategic Partners of the Carbon Pricing Leadership Coalition, convened by the World Bank as a partnership of peers including governments, intergovernmental organizations, nongovernmental organizations, and businesses. 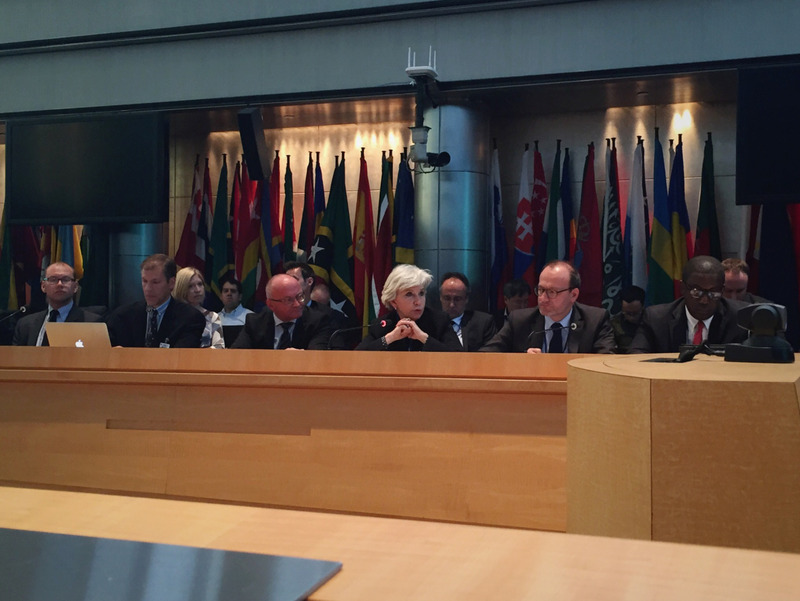 During the World Bank and IMF Spring Meetings, we joined planning meetings for the COP21, for developing economic support policies for national climate action strategies, and for elaborating universal principles for fair, aligned, effective and transparent carbon pricing. (Those discussions eventually led to the FASTER Principles, published by the World Bank, the IMF and the OECD, in September 2015. In Barcelona, we again joined the design process for the CPLC, during the 2015 Carbon Expo. 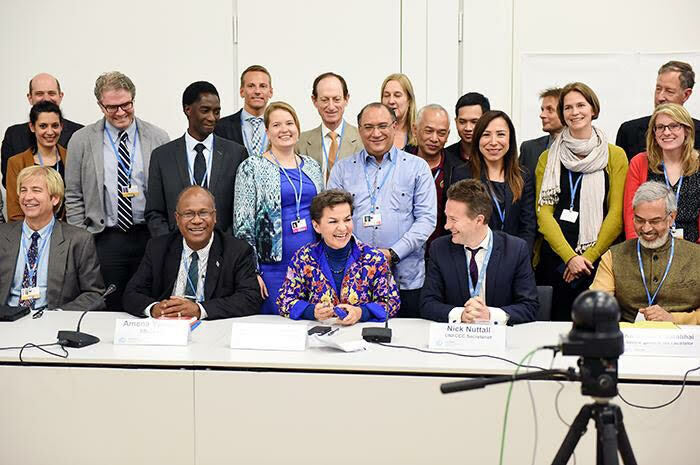 In June, we joined the ADP negotiations, and also conducted a 30-minute moderated press conference on the subject of How Citizens can Catalyze Climate Action. With three partners at the table, in a discussion moderated by Stuart Scott, we outlined a series of actions our coalition is engaged in to both expand the space for citizen and stakeholder engagement and to raise the level of policy ambition at work in the global process. We also joined the dialogues for the reform of Article 6 implementation (public participation in the policy process). At the request of Christiana Figueres, UNFCCC Executive Secretary, the “Article 6” agenda was renamed Action for Climate Empowerment (ACE). Our Pathway to Paris strategy was designed to be the foundation for the Citizens’ Climate Engagement Network, which itself will be proposed as a leading strategy for ACE implementation, through the UNFCCC subsidiary bodies, in 2016. The Pathway to Paris Project also hosted an open consultation on key issues raised in working sessions and which would allow citizens and stakeholders to provide input to the global process. This consultation was held through the World We Want platform, and helped to shape the specific themes that would become the thematic policy-focused workstreams shaping global citizen engagement for the COP21. Our Pathway to Paris Action Teams began to work on COP21 Logistics, Database and Calendar management, and Media—specifically a collaborative strategy to build up to 24 hours a day of coverage of the COP21, through a new volunteer-run online broadcast called Citizens’ Voice. In July, we presented this strategy for citizen participation at the global level during the UN High-Level Political Forum (HLPF), at UNHQ in New York, and then joined the intergovernmental carbon pricing panel discussion at the Climate Summit of the Americas. Through briefings and side meetings, we made sure that when carbon pricing is discussed broadly as a menu of options, we hear carbon fee and/or dividend or rebate alongside other options that favor institutions but not always the general public. In August, we activated both the Participation and Adaptation Workstreams. A coalition of youth leaders in Dhaka, Bangladesh, hosted the inaugural working session of the Adaptation Workstream, which will be a venue for reporting, discussion and innovation on issues relating to climate adaptation, loss and damage, and structural and political resilience, during the COP21. The creation of the Adaptation Workstream is a crucial step in forming the Citizens’ Climate Engagement Network, because in so many places around the world, the first contact most people have with climate change is not intellectual or political, but in confronting unmanageable impacts. For many people, a priority remains making sure their representatives in government understand the mounting challenges they are facing, day to day, from ongoing climate disruption. 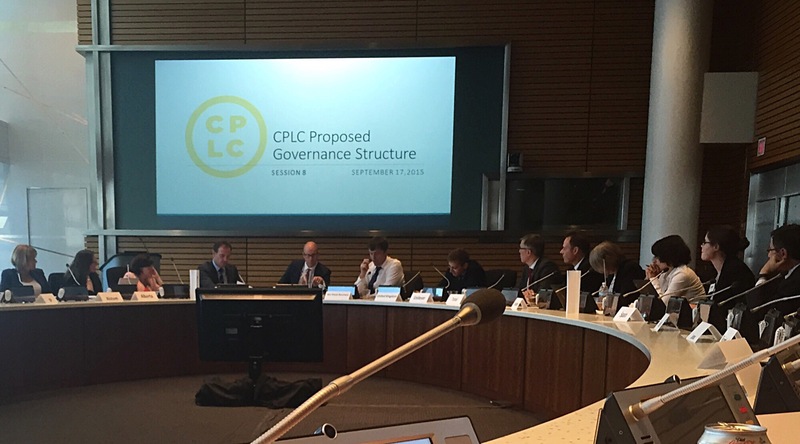 On September 16 and 17, we joined the historic Design Meeting for the Governance Structure and Work Program of the Carbon Pricing Leadership Coalition, at World Bank HQ in Washington, DC. The effort had been more than a year in the making. The World Bank Group’s climate team had developed an open letter calling on the world to move toward pricing carbon as an economically efficient strategy for accelerating climate action. By the time is was presented at the UN Climate Summit on Sept. 23 in New York, the letter had dozens of governments and more than 1,000 companies formally signing on, as well as hundreds of NGOs, including Citizens’ Climate Lobby. In a meeting convened by Pres. Hollande of France, during the UN General Assembly, 40 heads of state approved of this new model for global governance. The CPLC will serve as one of the Action Platforms for accelerating climate action, building prosperity and mobilizing the Paris agreement. The Carbon Pricing Leadership Coalition will launch on November 30, the opening day of the Paris climate negotiaions, and the first Annual Assembly will take place in the spring of 2015. At the Annual Assembly, executive level leadership of all the strategic partners—governments, IGOs, NGOs, and businesses—will have equal voice. 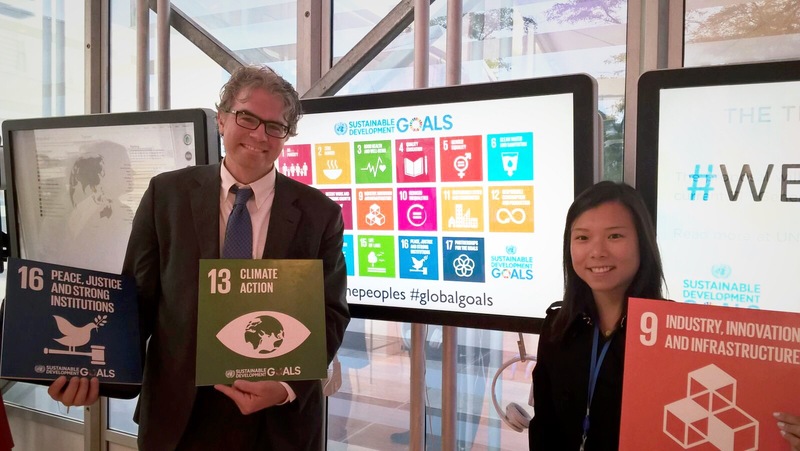 In September, during the UN General Assembly, as the UN formally adopted the Sustainable Development Goals, we activated the Global Goals Workstream, to focus on areas of overlap between each of the 17 Sustainable Development Goals and issues related to climate disruption and climate solutions. On October 25 and 26, we hosted the Minneapolis 2015 Climate Action: Last Stop Before Paris. The spirit of Minneapolis 2015 was laid out by former Minnesota Governor Al Quie, who said recently that action on climate requires: “Radical integrity, creative collaboration, and no excuses.” We will now work to ensure that those three standards embody the effort to give people around the world a voice in global negotiations. During the two-day event, Citizens’ Climate Lobby and the Partnership for Change brought together a diverse range of thinkers and changemakers to explore and develop concrete strategies for accelerating climate action. On Sunday, October 25, more than 170 people participated in 18 dialogue sessions and 3 plenaries, and joined the founding of the Citizens’ Climate Engagement Network. Review and comment on the governance strategy here. On Monday, October 26, we joined the Partnership for Change in convening a High-Level Dialogue, under Chatham House rules, to focus on developing an operational strategy for accelerating climate action, through both public and private sector engagement. This dialogue is the first in a series that will run through the Nobel Peace Prize Forum in 2016 and 2017, to advance strategic responses to tee connections between climate, peace, civics, and human development. The next in the series will take place in Paris, during the COP21. This month, we are activating Workstreams on Human Health, Oceans, and the Long-term Goal of achieving a Healthy Climate, and releasing the outcome documents from Day 1 and Day 2 of Minneapolis 2015. The high-level Chatham House rules dialogue, convened on Day 2 of Minneapolis 2015—Climate Action—Last Stop Before Paris, brought together climate experts and business leaders to focus on how to accelerate development and deployment of low-carbon technologies and climate-smart business practices. The October 26 dialogue produced an outcome document entitled “A Convenient Opportunity”, which will serve as the foundation for an 18-month dialogue process, focused on connecting policy leaders to leaders in business and civil society, to ensure the global climate response is real, ambitious, everywhere-active, and conducive to better outcomes for people around the world.